The pilot inspired model "QA", a large analogue quartz wristwatch with a very solid feel. 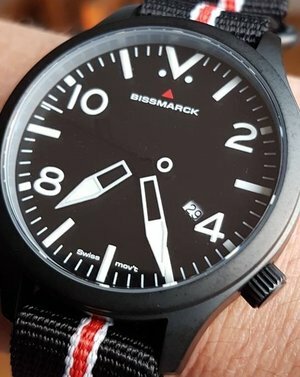 Bissmarck model "QA" is the first in our series of high end analogue quartz watches, designed with the same top quality components as our mechanical/automatic watches. Combined with a high end Ronda PowerTech 515 movement, this stylish watch is a great companion whether at a formal event or just kicking back with friends. Bissmarck model "QA" will be produced in a limited undetermined series. Stainless steel 316L case with PVD plated surface, screw down stainless steel case back, fixed bezel, crown, double flange spring bars and 4-ring NATO wristband with regular buckle. Sapphire crystal front with AR coating. C1 luminous on hands and dial. Case 10 ATM / 100 M water resistance. ~45 months (battery model 371 of 1,5 V). Typically within 0 +20/-10 seconds/month, but this may vary. Complete watch, watch box and instruction manual on 4 GB USB stick. Always study the instruction manual carefully before handling the watch as wrongful handling may cause permanent damage to the watch, not covered by the warranty. Operating the crown, setting time/date before reading the instruction manual is prohibited. When the seal around the watch is cut/broken, Bissmarck will immediately consider the watch used, regardless of the actual event leading to cutting/breaking the seal.